This isn’t the first time Chief James Loftus pushed to use technology to help his officers be more effective and better protect their communities. Prior to working with the University of Pittsburgh Police Department, Loftus held every sworn rank in the Miami-Dade Police Department between 1983 and 2012. During his time as the director of the Homicide Bureau, Loftus enacted a policy requiring investigators to record videos of homicide suspect interviews. Bureau disapproval was initially strong, but soon faded when investigators began to see recording as an asset in evidence collection rather than a burden. This year, Loftus led Pitt police in equipping every sworn officer with a Taser and a body camera, with the program becoming fully operational in November last year. Pitt police acquired the equipment through Axon, a company considered by many law enforcement agencies to be the industry’s gold standard on body-worn cameras and conducted energy devices. The Taser falls under a category of weapons that can injure through high voltage. Unlike a stun gun — which inflicts pain through the sensory nervous system — the nitrogen gas-propelled probes in a Taser overstimulate the subject’s motor nerves, locking up their muscles and impeding further violent action. In addition to the Taser, Pitt’s police officers are now equipped with the Axon Body 2, a chest-mounted camera capable of recording in high definition through a 143-degree field of view. When activated, the camera starts recording but also retains the 30 seconds of footage before activation, allowing investigators to preserve critical context to an unfolding situation. Currently a deputy sheriff in Beaver County, Mark Romutis is an adjunct professor at Pitt with 35 years of law enforcement experience. Romutis said Tasers play a visible role in preventing injuries to both officers and suspects by securing compliance without the need for physical force. Romutis and Loftus emphasized the role Tasers played in the “use-of-force continuum” — a term used to describe the guidelines on how much force could be used against a resisting subject. Both said Tasers do not replace any existing equipment, such as batons, but instead occupy their own position on the continuum, giving officers another option when approaching a suspect. Romutis’ experiences with the Taser are consistent with studies conducted at Loftus’ former workplace — the Miami-Dade Police Department. A four-year study by the U.S. Department of Justice of 762 use-of-force incidents in Miami from January 2002 to May 2006 found that the use of Tasers was associated with a 68 percent reduction in officer injuries. It also found that Tasers decreased the odds of suspect injury, compared to hands-on interaction. Body cameras could also have a positive effect at Pitt by increasing accountability and reducing use of force. A Police Executive Research Forum study of nearly 10,000 officers found a connection between the use of body cameras and a decrease in citizen complaints. In the Rialto Police Department in California, a body camera trial in 2012 led to a 64 percent reduction in the use-of-force rate compared to previous years. At the same time, citizen complaints dropped 88 percent. However, one of the larger body camera studies to date — a seven-month trial of more than 2,000 Washington, D.C., police officers conducted by the Office of the City Administrator — found that body cameras had no statistically significant effect on civilian complaints and no detectable effect on documented uses of force. These less optimistic studies suggest we should temper our expectations of new equipment — while recognizing the improved accountability and investigative tools at Pitt Police’s disposal. Body cameras also improve an often overlooked aspect of police investigations by documenting not only people, but settings and objects. Loftus pointed to investigations into the homicide of a Pitt student last October where officers combed the crime scene and used body cameras to document evidence. Without the cameras, officers normally describe details of a crime scene based upon memory, which can often be faulty. While the new equipment presents potential for risks and abuse, Pitt Police and equipment providers are taking steps to reduce and prevent these risks altogether. Tasers aren’t a perfect solution — since the early 2000s, Tasers have been involved in more than 400 wrongful death suits — but studies show they’re safer than other alternatives. According to an LAPD study, every 1,000 exposures to a punch results in 780 serious injuries and every 1,000 exposures to a kick results in 450 serious injuries. For Tasers, every 1,000 exposures results in two serious injuries. Unarmed techniques like takedowns and grappling are five times more likely than a Taser to result in subject injuries and four times more likely to result in subject hospitalization. The National Institute of Justice gathered a panel of experts from the College of American Pathologists, the National Association of Medical Examiners and the Centers for Disease Control and Prevention in 2011 to study the risks of Tasers. The panel concluded that Tasers create less risk of injury to both officers and suspects alike, and this is especially true when Taser exposure is limited to 15 seconds — a recommendation included in Pitt Police’s Taser policy. Pitt’s Taser policy and training can also dictate the level of risk a subject faces. Pitt Police’s Tasers are equipped with battery packs that limit the length of exposure to five seconds per deployment. Not only does limiting the length of Taser exposure improve safety, it also makes officers more effective. If repeated Taser exposure has not produced the outcome the officer needs to make an arrest, it’s a clear indication that other options beside the Taser should be explored. 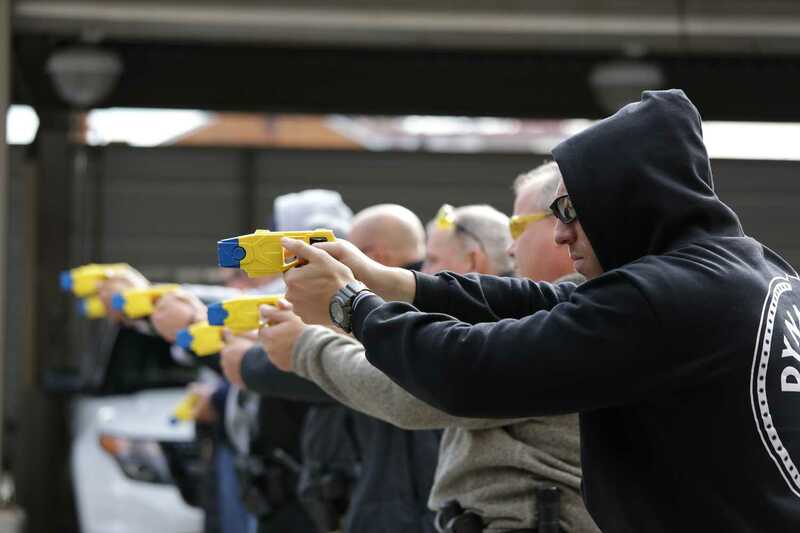 Pitt Police’s Taser training and policy also focused on avoiding the use of Tasers on individuals who would be more susceptible to the risks of Tasers because of factors like smaller stature or pregnancy as well as mental health considerations. Imminent and serious safety risks, however, take precedence over concerns about stature or emotional state. The Pitt Police deployed a Taser for the first time last December on a woman who had fled UPMC Presbyterian and was weaving in and out of traffic on Forbes Avenue. This woman was admitted to UPMC on mental health concerns after she had been arrested earlier that day, but pressing concerns for her immediate well-being necessitated the use of a Taser to stop the incident on Forbes from worsening. The risks of Tasers are not limited to the equipment themselves. One of the deadliest risks is weapon confusion — where an officer tries to draw a Taser but inadvertently draws a firearm. These instances are extremely rare, and an Americans for Effective Law Enforcement report details just nine cases over the course of eight years. But the consequences are potentially devastating, so Pitt Police took steps at multiple levels to minimize the likelihood of weapon confusion. “We were very careful about putting the Taser on the opposite side of the body from the firearm,” Loftus said. “It’s a different color, it’s carried in a different type of holster, it’s activated in a different way, it’s on a different part of the body.” These cumulative changes work together to prevent weapon confusion. Body cameras also present their own risks for distorting accountable policing. A report released by Upturn and The Leadership Conference on Civil and Human Rights noted that officers viewing footage after a use-of-force incident could potentially impact their ability to describe their recollection of the event in the report. To ensure honest investigations into a use-of-force, Pitt Police officers are required to recount the details of the incident from memory before they are able to view their own body camera footage. Axon also instituted a series of security measures to prevent and deter the tampering of evidence. Each frame of recorded footage is assigned a digital ID. Anyone who views, edits or interacts with a video in any way is identified, recorded and logged. And even when edits are made, an original copy is always kept. Both body cameras and Tasers, though recent additions to the daily lives of Pitt Police officers, have already made advancements in the way officers conduct investigations. Seeing these changes, Loftus drew parallels between his recording policy in the Miami-Dade Police Department and the new body cameras equipping the Pitt Police. But Loftus ends with a cautionary note. Jeremy primarily writes on gun policy and violent crime for The Pitt News. Write to Jeremy at jiw115@pitt.edu.